Ladyfolk Studio: finding and creating beauty in the everyday. Fashion illustration, watercolor workshops, and event artist available for commissions. Based out of Laguna Beach, California. 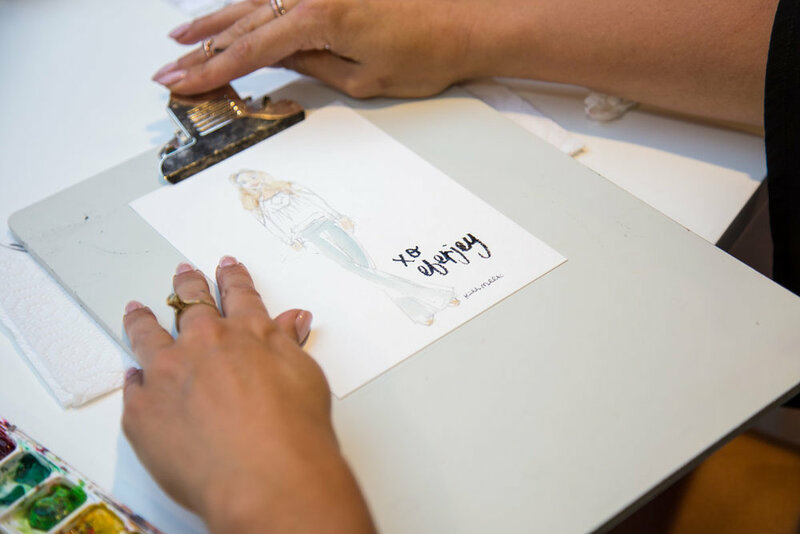 Kimberly Heimbach (Malachowski), best known for her whimsical fashion illustrations and unique Watercolor and Wine workshops, is the creative mind behind Laguna Beach based Ladyfolk Studio. A Southern California native, Kimberly originally attended college in New York for ballet at SUNY Purchase before injury caused her to return home. She quickly switched majors and graduated with a degree in Illustration with an emphasis in Graphic Design with partial merit scholarship from Laguna College of Art and Design in Laguna Beach, California. Kim has since worked in-house illustrating for established brands including Pottery Barn. She now enjoys running her own creative art business and teaching design part-time at the college she graduated from LCAD. Fashion and travel inspire her work that is often described as intuitive, whimsical and colorful. Her favorite medium to work with is watercolor. Recent collaborations for Kimberly include working with Eberjey, Anthropologie, The Outlets at Orange and the Bloomingdales Outlet. Kimberly hopes to be an infectious light of joy and to inspire others to embrace their own creativity. The texture of watercolor paper, the flow of calligraphy, original art, a vintage frame, the ocean breeze, the firewood crackling, a pencil sharpening, a glass of wine being poured, fresh flowers, new ideas. This and more is Ladyfolk Studio. Always original, a perk when working one-on-one to bring your creative vision to light. Your ideas come to life, you are not pin holed to a template. Let our discussions on color palettes, inspiration and fonts be your guide not Pinterest. Get immediate feedback on your ideas with a consultation. As both a designer, illustrator and professor, Kimberly can accommodate many needs. She often refers to herself as "Jill of-all-trades" in the creative services. Let her handle the art, branding, entertainment and art take-home gifts for your next unique event in Orange County. Interested in collaborating on a creative project? hosting a workshop? need live event art ?or custom illustrations? Maybe you are interested in studio or in-home art lessons for your child in Orange County?